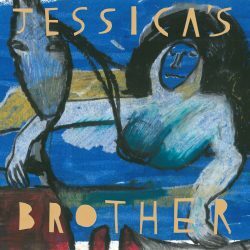 Jessica’s Brother are a group from London formed in 2016, after drummer of The Wave Pictures’ Jonny Helm’s girlfriend (Jessica) introduced him to the man who would become primary songwriter in the group, her brother, Tom Charleston and with the inclusion of bassist, Charlie Higgs, the trio was complete and Jessica’s Brother was born. A mere nine months afterwards, the trio entered The Booze Cube in Stoke Newington to begin recording what would become their self-titled debut album. Musically, the record is largely a sombre affair, from beginning to end, taking lyrical inspiration from the classic works of the Brothers Grimm and poets such as T S Eliot in the hope of engaging their audience in a unique and interesting way whilst metaphorically tackling modern-day issues. First track on the record ‘Getting Obscene’ has an almost grunge feel to it as it meanders along, setting the expectation of for what is to come throughout the rest of the record in both tone and pace. This leads into the second track, and first to blatantly reference the children’s tales of old, ‘All The Better’, which subtly references Little Red Riding Hood throughout. This track, whilst similar in tone and pace to the opener, contains strings, which, when combined with the interesting lyrical content, show a more interesting and original quality to the band in comparison with the first track. As the album progresses through its 10 tracks, the band experiment with their sound and at times, where their influences on their sleeve. The most prominent and immediate example of this is on the fourth track and personal favourite, ‘Dylan’ which beings with finger-picked guitar and is vocally reminiscent of Subterranean Homesick Blues without any plagiarism and accomplishing both a tribute to the style and originality. ‘Humdinger’ stylistically reflects back to the earlier tracks on the album in its melancholy vibe whilst ‘Overnight Horror’ takes an electric approach with a harsh and immediate vocal delivery unlike anything else on the album and is a welcome change of pace however, the track doesn’t sound quite as polished and accomplished as the earlier tracks or the final three-pronged attack (for lack of a better phrase) of the album which see’s the band finish up with some of the best tracks on offer here. The songs are predominantly, slow paced, lyrically exploratory tracks and not to detract from the musicianship, it is evident that the band will appeal to music lovers looking to listen to, and interpret the references, the metaphors and the messages within the poetic lyricism as opposed to those looking to dissect the instrumentation on offer. Overall, the band have put together a collection of inspired and lyrically interesting songs in which there is a lot to explore however, at times, the pace and tone leave the offering slightly repetitive at times which is unfortunate given the natural talent the group share as songwriters but not surprising given their relatively short time together, and as their career progresses and they grow as a band, it is clear that there is potential for them to expand on their creativity and hone their songwriting craft into something quite unique.